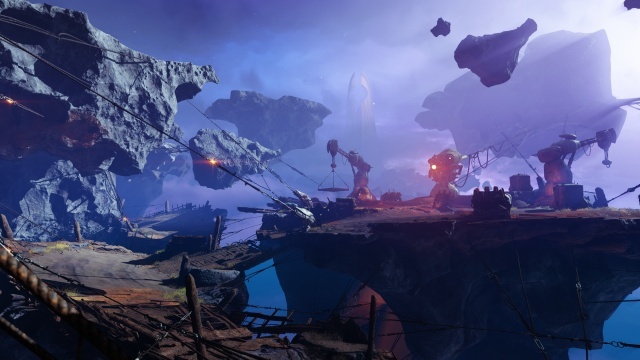 Thoughts on Destiny 2's Forsaken expansion's campaign's opening mission after hands-on time with it at E3 2018. Anyway, as far as the hands-on demo went, it was an enjoyable mission that ran for roughly a half hour. The breakout in the Prison of the Elders has released all manner of enemies from across the Destiny factions roster and they're as interested in fighting amongst themselves as they are in fighting a Guardian trying to put down the riot. There were times when the best course of action was to let them battle it out for a bit and thin their own ranks before jumping into the fray myself. The prison itself was in bad shape from all of the rioting, but that helped to make for some great visuals in the mission - most dramatically in what was essentially a canyon between two multistory blocks of cells. The scale of the area, the lighting, the destruction it suffered, and the constant battles of the escaped prisoners make for some memorable scenes in this opening level. I don't want to spoil anything about the story, but even if I did I suspect that the demo may have cut off a bit early before the actual mission in the expansion will end. Overall the level was heavy on gunplay, with very little downtime between the firefights. There wasn't anything ground-breaking to it in terms of gameplay, though, it was a standard style Destiny 2 campaign mission at least until the point at which it cut-off. During the demo level I had access to the new bow weapons that are coming with Forsaken. The bows are both slower and harder to aim and have a slow rate of fire, but the benefit is that they do a large amount of damage and the arrows can have secondary effects such as chain lightning. I found the bow worked best for me as a standoff weapon, but once the shooting really began I felt I needed the rapid-fire capabilities of a good rifle. And that's about all I can tell you from a brief hands-on demo. Look for more on Forsaken as we get closer to its September launch date.